On April 14, 2012, China’s Ministry of Finance issued the new “Measures for the Administration of Special Funds for Subsidizing Foreign Patent Applications,” effective on the day of issuance to replace the prior “Interim Measures for the Administration of Special Funds for Subsidizing Foreign Patent Applications,” which were issued in 2009 by the Ministry of Finance. The regulation outlines policies for financial assistance for Chinese who file patent applications abroad. Who Is Commenting on the Copyright Law Revisions? The National Copyright Administration released its draft of revisions to the Copyright Law on March 31, 2012, with comments due by April 30, 2012. Thus far, approximately two thousand comments have been received. The draft is not yet calendared for formal consideration by the State Council Legislative Affairs Office (SCLAO) for this year, or by the National People’s Congress. In addition, further consideration may be delayed because there are other IP laws, such as the Trademark Law and Anti-unfair Competition Law that are still pending with the SCLAO. However, Vice Commissioner Yan Xiaohong of NCA noted at the recent Federal Circuit Bar Association conference in Beijing that he expected submission to the State Council by the end of the year. With the impending departures of Nancy Kremers in Beijing and Conrad Wong in Guangzhou, two key PTO positions in China are now opening up. The 2013 “Suzhou-Silicon Valley” International Innovation Conference will be held in Suzhou, China on July 7-8, 2013. The Conference is jointly organized by the Center for Enterprise Innovation and Development at Soochow University, Lucas Graduate School of Business at San Jose State University, the China Institute for Science and Technology Policy at Tsinghua University, School of Information of UC Berkeley, and supported by many prominent organizations such as the Western Returned Scholars Association (WRSA) of China. Researchers, educators and students, policy makers, consultants, entrepreneurs and corporate managers are encouraged to submit papers. More information can be found at http://ceid.suda.edu.cn/2013conference/index.asp. My presentation in the opening of the US-China IP Adjudication Conference got a lot of applause. The USPTO and the U.S. Court of Appeals for the Federal Circuit May 28-30 co-sponsored an intellectual property adjudication program with Renmin University of China, the China Law Society, the Bar, and others. 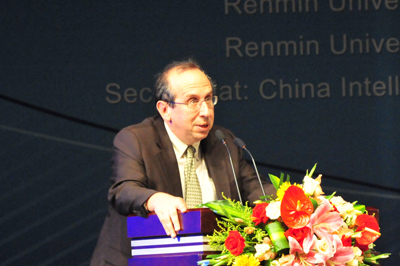 More than 1,200 people attended the three-day program, including nearly three hundred judges from China’s judiciary; hundreds of lawyers and business people from the United States and China; several hundred Chinese academics; and, most importantly, seven judges from the Federal Circuit, as well as a like number of judges from the Supreme People’s Court. There was an “en banc” Q-and-A session between the Federal Circuit and China’s Supreme People’s Court, a moot court involving a common fact pattern that resulted in a nearly identical adjudication on the same set of facts, and breakout sessions on such topics as pharmaceutical patent adjudication, copyright (including online infringements) and trademark developments (including “squatting”). The program was a milestone in bilateral judicial, intellectual property and rule of law exchanges.